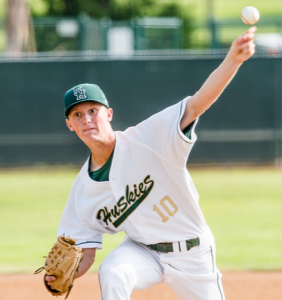 Sierra Vista 9, Gladstone 0 — Anthony Deeter pitched a complete game and improved to 4-0 to lead the Dons to the Montview League victory. Wilson 10, Rowland 4 — The Wildcats scored six runs in the top of the ninth inning to defeat the Raiders for the Valle Vista League win. Matthew Rodriguez pitched six innings, striking out six, Vincent Santana had a triple and an RBI and Hector Hernandez went 2 for 4 with a double and an RBI for Wilson (14-6, 3-3). San Gabriel Mission 3, Bishop Conaty-Loretto 1 — Tristen Oliva was the winning pitcher, striking out eight, and had a double for the Pioneers (12-8, 6-2) in a Horizon League victory. 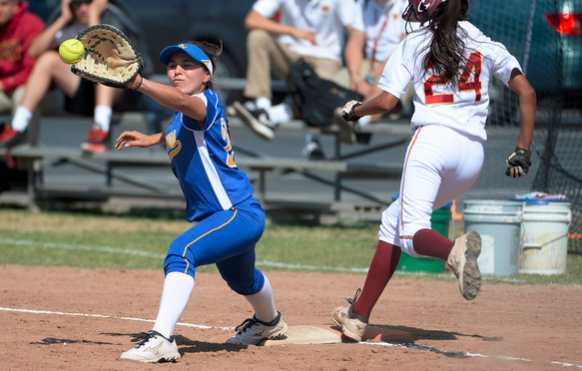 Alyssa Andrade had a double and an RBI and Christina Rosas had an RBI for San Gabriel Mission. Gabrielino 211, Marshall 254 — The Eagles had the top five players of the day at Alhambra Golf Course par 36 to defeat Marshall for the Montview League victory. Michael Lam shot a 38, Nathan Duong shot a 40, Isaac Lam had a 43, Cyrus Lam had 44 and Ryan Tran shot a 46 for Gabrielino (12-1, 9-1). STORY: Charter Oak moved into a tie for first in the Hacienda league by beating league favorite Chino 6-2 at home Thursday. 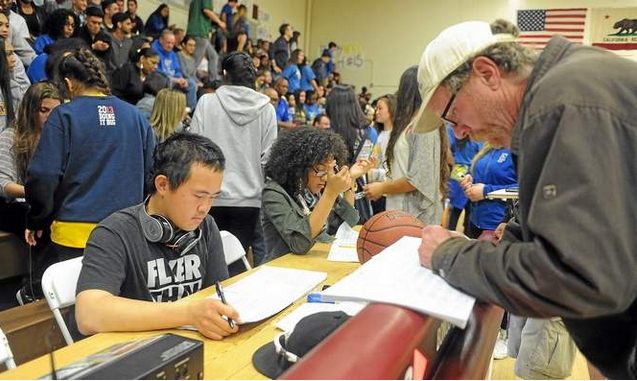 Charter Oak improved to 15-7 and 5-1 in the Hacienda while Chino dropped to 14-5 and 5-1. Earlier in the day Michelle Gardner and I thought the Chargers had no shot. That’s why they play the games. @MGardnerSports There you have it Charter Oak, Gardner gives you no shot. Sadly, hard to argue with it. MONTEBELLO — Cantwell High School began the week with an outside shot for a Del Rio League title.Bishop Amat put an end to those hopes early Thursday.Alyssa Barrera and Madeline Ramirez each had four RBIs to lead the Lancers to a 17-0 victory over the host Cardinals in a Del Rey League game that was halted after five innings due to the 10-run rule. Ramirez and Barrera had three and two hits, respectively, for Amat, which improved to 15-6 overall and 8-1 in league play. The win keeps the Lancers tied for first with St. Paul, who they face on May 11. Britney Huerta and Julia Guzman had singles for the third-place Cardinals, who slipped to 12-10 and 4-5.Cantwell lost to Amat, 3-0, on April 14, and the Lancers made sure early this one would be different. They scored three runs in the first and seven in both the third and fourth to put it away. San Dimas only needed four innings with pitcher Peter Lambert in a mercy-shortened 10-0 victory over Covina to run its perfect record to 24-0. San Dimas is three games shy of matching Bishop Amat’s 1993 San Gabriel Valley record for consecutive baseball victories with 27. 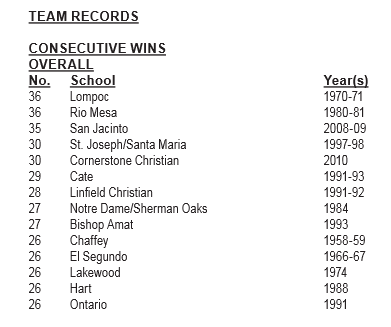 Bishop Amat didn’t win the championship that year, but its 27 straight wins is eighth all-time in the CIF record books. 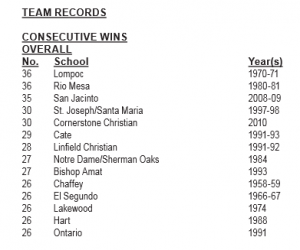 Lompoc owns the CIF record for consecutive wins with 36 set in the 1970-71 season. 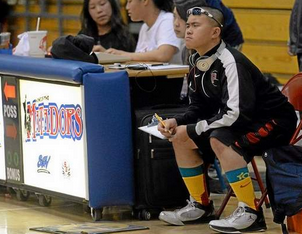 Odds are you’ve heard Corey Kwok’s voice if you’ve been to just about any local high school sporting event.From baseball to basketball to football to even girls volleyball, Kwok, who is known by most as “Corn Dawg,” has become the voice of the Valley … and parts well beyond. His booming voice may not match his frame, but it’s certainly caught on and made him one of the most recognizable figures on the local sports scene.It’s a pretty good niche Kwok has carved himself. He does the public address announcing for local sporting events and in return gets to be around the sports and people he loves. Sometimes, a few bucks get thrown his way, too.Not bad for someone who doesn’t drive and rarely has a working cell phone.“It’s above and beyond so worth it because of the people I’ve met and continue to meet,” Kwok said while interviewed at a Pasadena noodle restaurant just minutes before catching a train to his next assignment. “I enjoy it when people I don’t know come up to me and commend me for a great job. It’s not just fans and parents, it’s players, too.”Kwok, who prefers to go by his more adult-sounding moniker “Swaggy C,” is known for his sometimes flashy appearance. He tries to rock the latest popular basketball shoes with some wild socks as often as his wallet allows. It makes him very distinctive for fans to notice. It used to be that spring football marked a special time on the high school football calendar. It was a first step toward the upcoming season, if you will. Players and coaches would reunite and for three weeks or so hold practices in T-shirts and shorts, the consequences of which are debatable. These days, though, spring practice is merely the latest activity in a offseason of that seemingly never ends. 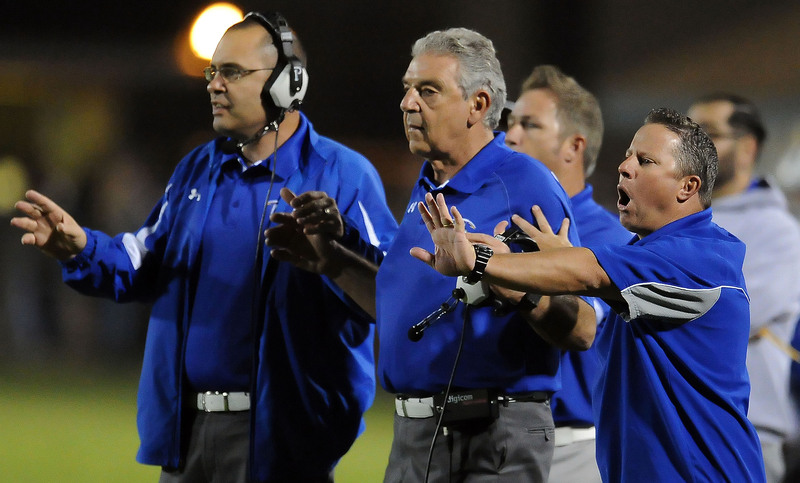 “Spring football isn’t spring football anymore,” veteran Charter Oak head coach Lou Farrar said. “The offseason is never really ‘off’ anymore. When real football practice started in August, you used to wait for it. But it’s always there now. Over the next week or so, most area teams will begin their own manicured version of spring practice. At Charter Oak, the practices will be four days a week and offer a chance to any would-be player on campus to join the 68 guys who have been part of the offseason festivities since the season ended last November. Farrar isn’t expecting a big turnout.